Thanks to Dr. Joseph Fullmer, University of Wisconsin Hospital and Clinics (USA), for contributing this case and the discussion. To contribute a Case of the Week, follow the guidelines on our Case of the Week page. (1) New updates to our CME / Apps page include an advertisement for BoardVitals Pathology Question Bank and a free Apple app - Boardvitals Review for Clinical Pathology. (2) We have updated the Lung tumor chapter based on reviews by Drs. Deepali Jain and Fulvio Lonardo and the Salivary glands chapter based on reviews by Fatima Aly, M.D. and Adriana Handra-Luca, M.D. (3) To all reviewers / Case of Week contributors: we are now requiring you to provide us basic information (name, mailing address, US tax ID number (if any) and nonUS tax ID number (if any) to enable us to comply with US tax laws. We will send a 1099 form to US residents who earn $600 or more in any calendar year. For non US residents, unfortunately we must withhold 30% of all payments, and forward this amount to the US government (see IRS document). You may be able to get this money refunded - you should check with your tax advisor. Unfortunately, we are unable to give you tax advice. We will apply this rule to all new work started January 25, 2013. If you change your mind about wanting to contribute cases or review topics, just let us know. We apologize for the change, but we have no choice. (4) We have removed the Topic search from the Home Page, since it wasn't working. We are developing a new architecture for the website, to first appear this summer, which will have a functioning topic search. For now, you can use the Google Search box to search for any text on the website. You can also use the Search feature of your browser (often Control F) to search for text on a particular page. (5) We have recently updated these topics in our Stains chapter: bclXl, BRCA2, Metalloproteinases (MMP), PPARγ, OCT4, OPA1. We are also looking for reviewers for our popular Stains and CD Markers chapters, preferably in sets of 5 markers at a time. Please review our Instructions, and if still interested, contact Kristi at kristipathology@gmail.com. Please send us your CV and a list of the markers you would like to review. 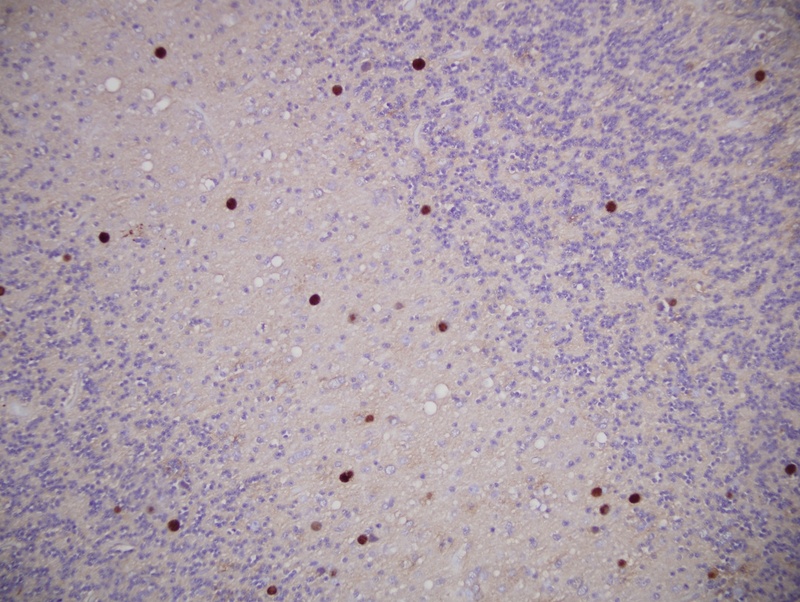 A 61 year old man had abdominal follicular lymphoma diagnosed 7 years ago, treated with chemotherapy and radiation, and thought to be in remission. He developed increasing difficulties with balance, dizziness, numbness over his left tongue and inside cheek spreading to his face, as well as clumsiness with his left hand and leg over a 7 week period. MRI revealed a 3.8 x 2.3 x 2.4 cm lesion with minimal edge enhancement (hence predominately non-enhancing) centered in the left middle cerebellar peduncle extending into the left paramedian pons and left cerebellar hemisphere. 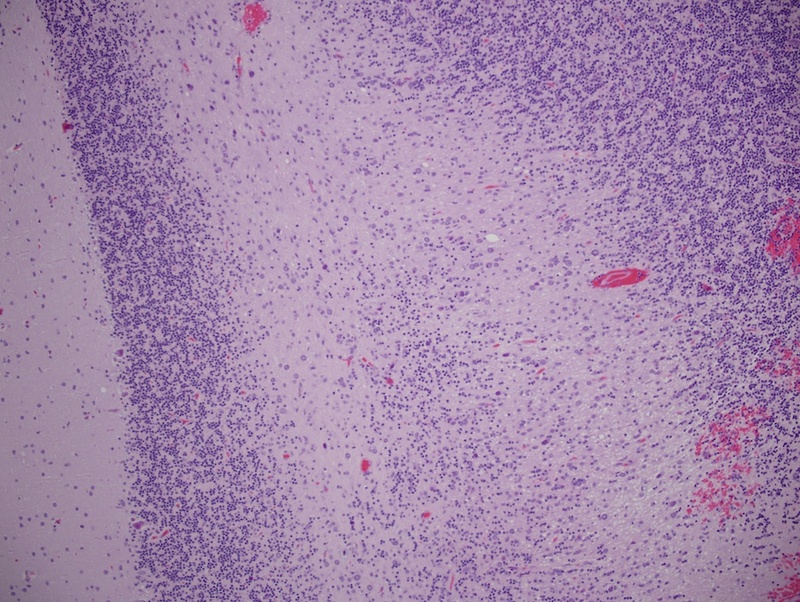 Preoperative differential diagnosis included demyelination, low grade glial neoplasm, and recurrent lymphoma. Biopsy of the mass was performed. 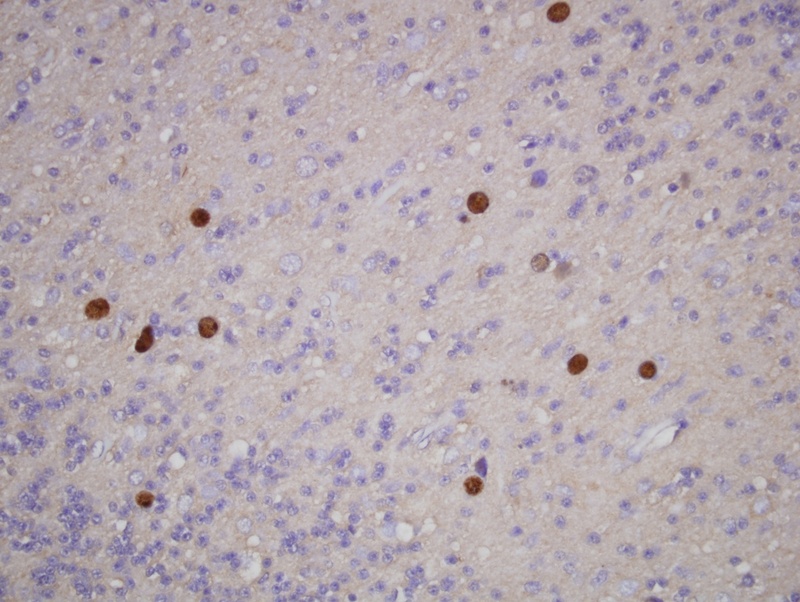 Progressive multifocal leukoencephalopathy (PML), also known as progressive multifocal leukoencephalitis, is a rare and usually fatal demyelinating disease characterized by progressive multifocal white matter damage and inflammation, due to the JC virus (Discov Med 2011;12:495). It is almost always associated with immunosuppression, including immunosuppressive/biologic therapy for autoimmune diseases, such as natalizumab for multiple sclerosis (Mult Scler 2012;18:143), and other agents for rheumatoid arthritis or lymphoma (Wikipedia, Joint Bone Spine 2012;79:351). Lytic infection of CNS oligodendrocytes leads to their destruction and progressive demyelination, resulting in multifocal lesions. Although PML previously was relatively rare, it now occurs in 3-5% of HIV+ individuals, and is classified as an AIDS-defining illness (Clin Microbiol Rev 2012;25:471). 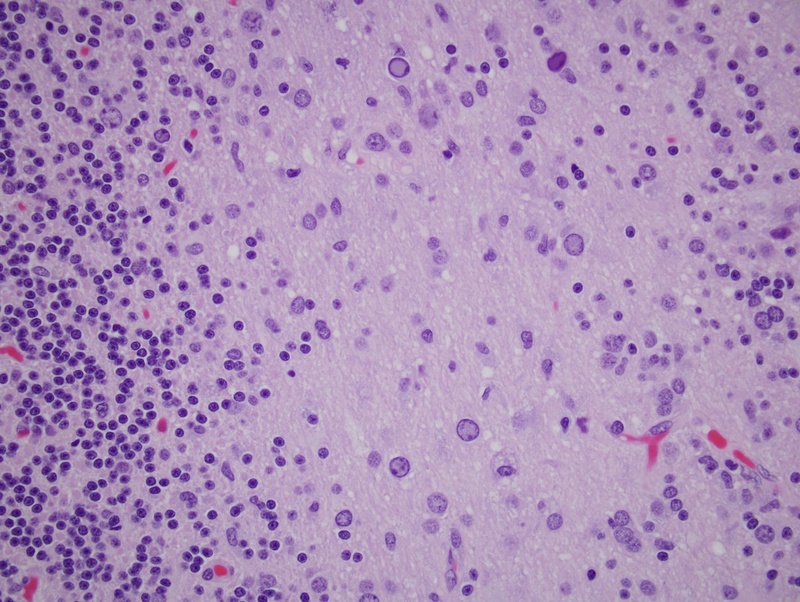 Biopsies show multiple foci of demyelination with enlarged and bizzare astrocytes, which are often multinucleated and have multiple large processes (University of Oklahoma). 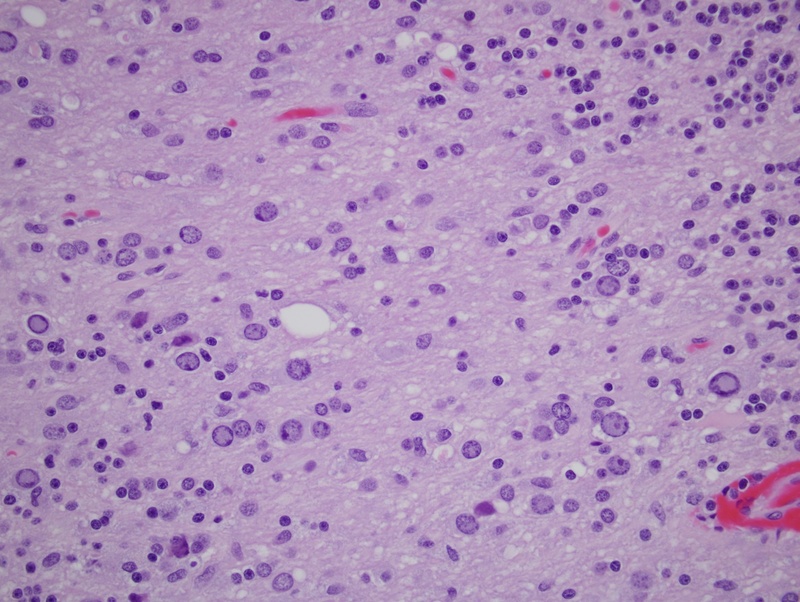 Oligodendrocytes may have eosinophilic or basophilic nuclear inclusions, due to virions (Acta Neuropathol 2010;120:403). Lymphocytic infiltration is variable. 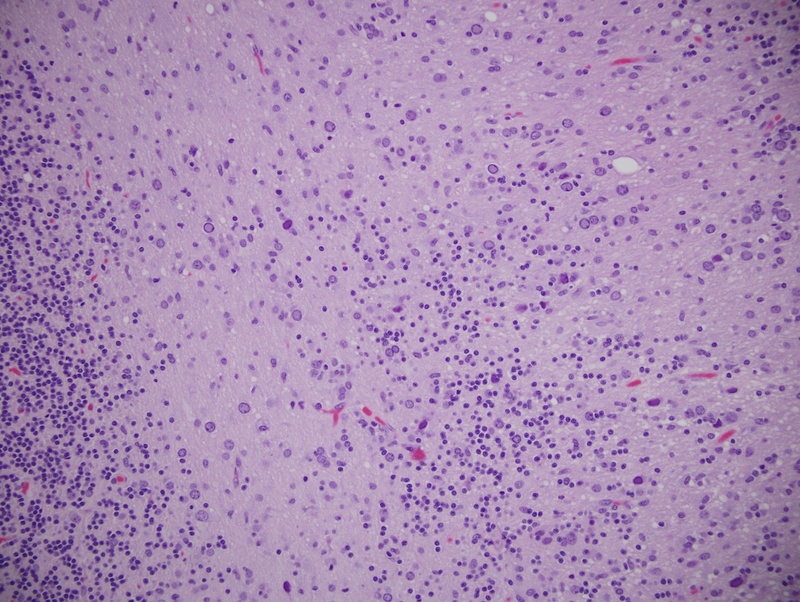 Necrosis with inflammation resembling an infarct may also be seen. Treatment consists of reversal of the immunosuppression, if possible. Case reports now suggest some treatments may be effective (J Neurol Sci 2013 Jan 31 [Epub ahead of print], Ann Acad Med Singapore 2012;41:620).